This guide will walk through how to compute total cost in a Fulcrum app live in the field using custom calculation fields, with a slightly more advanced method than our simple example. 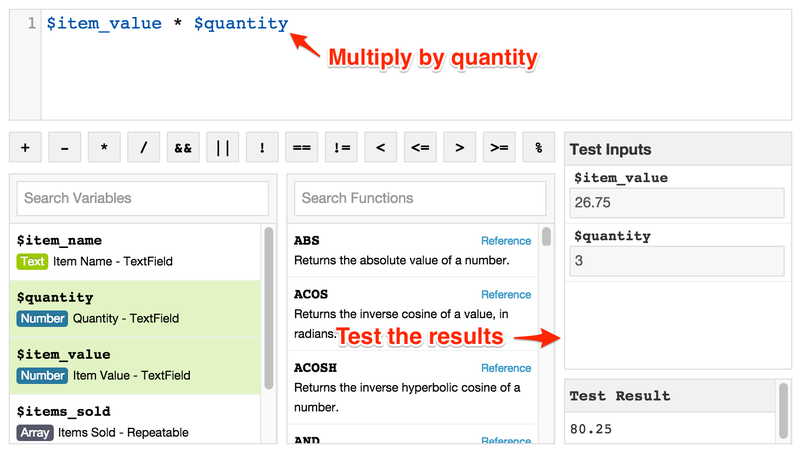 From a mobile device, a user can enter the value of multiple separate items in a repeatable section and have a calculation field compute the total. In this example, we have a numeric field within a repeatable section for an item’s value, including other values for an item name, quantity, and a calculation for subtotal of each repeatable item added (value * quantity). Repeatable sections allow you to create many sub-items underneath a single record, which is great for this example of adding X number of items to an individual “Sale” transaction record. We start out by adding a repeatable section that will allow a user to add any number of items sold to a record for a “sale”. For each item that a user adds, they can enter a title, a unit cost, and a quantity, and the “subtotal” calculation field will multiply the values to get a subtotal. Outside of the repeatable section at the top level, we then add a “Total” calculation field to look at all of the individual items added and sum up their subtotal values. Using the [REPEATABLESUM]()function, the expression will take all of the individual “Item Subtotal” values and add them up. Here’s a quick video overview showing how to build more advanced cost calculations with repeatables, with a demo of a working example on an Android device to show the behavior.